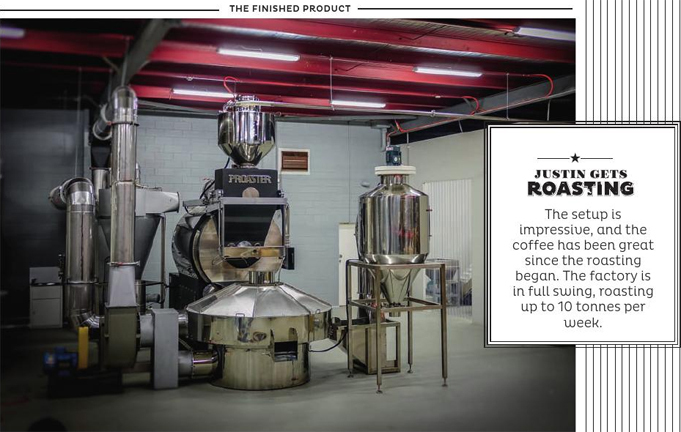 Justin and his partners decided on the Proaster 120 kg Batch Roasting line that included a green bean loader, destoner, afterburner and PLC control system that is manufactured by Taehwan Automation in Seoul, Korea. This wasn't an easy decision for Justin to make, given that this would be the first industrial installation of a Proaster line here and so would present certain challenges in relation to timing and compliance for the local market. I also had no experience with the brand other than what I had seen at trade shows, so a quick trip to Korea was organised to inspect the quality of the equipment, as well as to nut out the viability of importing and installing one for AESP. I was also looking for a premium end range to add to our roaster product portfolio, so figured this would be a great opportunity. Before going, I knew South Korea was a very strong manufacturing country, given the success of their car industry, so I was expecting quality manufacturing processes. Sometimes this doesn't translate into quality food or beverage processing equipment, so I was very interested to see what other roasting companies were doing in the market and the quality of the coffee they were producing. What I wasn't aware of was how developed their coffee market is. The Korean specialty coffee market is booming. I was pleasantly surprised to see cafes roasting in house and serving coffee in a number of different ways. Although they are more filter coffee oriented, if anything they have on average more advanced palates given they are less reliant on milk based blends and seem to embrace the serving of single origin. A lot of the cafes and roasteries I visited had walls proudly displaying training certificates. I felt their obsession with coffee rivalled ours and that I could learn a lot from what they are doing in their market. I was pleasantly reassured that this was a culture that focused on quality, which was only more evident when I visited a supermarket and was amazed at some of the innovative packaging they were using. The larger scale roasters I visited all had advanced plant setups that were climate controlled. These were factories as good as you would see anywhere around the world. Quality control was evident everywhere, and proper cupping and sample procedures were in place in most establishments. 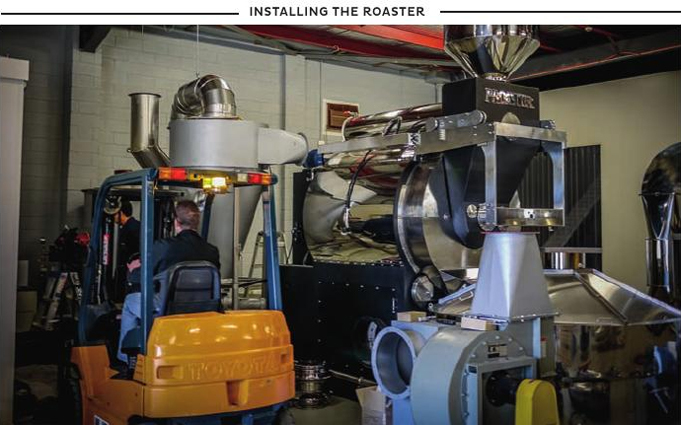 After seeing a few of the Proaster industrial lines in action, I was convinced it was a quality piece of roasting equipment, and the coffee results were as good as I had seen anywhere in the market in the industrial sizes. I gave my opinion to Justin, knowing that he had high expectations given his background in working with Probat roasting equipment. I think the deciding factor for me was that Proaster started off in manufacturing food processing equipment, which to this day is still a large part of their business. Some of the equipment they produce is very complex and requires expert knowledge in the food industry. On visiting their factory, you could instantly tell that the focus was as much on the quality of the coffee and service, as on the quality of the manufacturing processes. The timings were always going to be tight for AESP so for new equipment, this was a much faster option than Europe. In March of this year, it was full steam ahead with the order, and there was much to do with preparation for impending arrival. Justin and his partners had secured a storage location, so plans were drawn up for the installation. 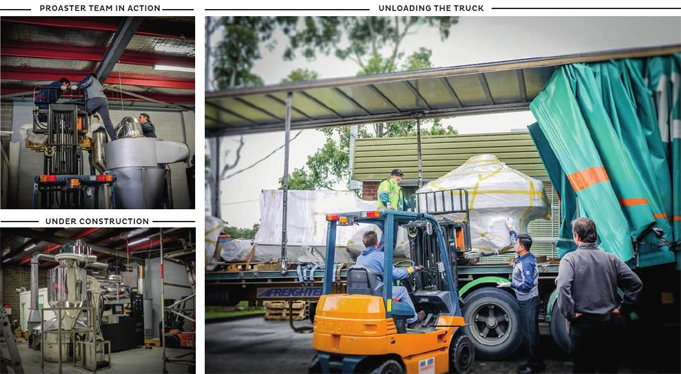 To keep up with all the coffee that would be roasted, AESP had also invested in an Italian made Dolzan packing line. The plans went back a forth a few times, as positioning of the equipment was finalised. One key consideration was the height of the industrial unit, which was lower than most, but the Proaster 120 kg line is quite high due to the connecting piping - everything fitted well in the end. Also considered were the power and gas requirements to make sure there was sufficient supply and connections. This setup also required water connections for safety sprinkler systems and compressed air connections for the pneumatic valves and gates. One of the most important things to consider when setting up a roasting plant is the process flow from where green coffee comes in and is stored, to the roasting then packing and then roasted coffee storage. A poorly laid out factory can produce a lot of inefficiencies. This was one of the key considerations taken into account with the layout of AESP's factory. Our strict gas safety standards are one of the main difficulties in getting roasting equipment up and running. 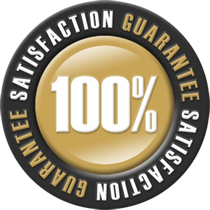 With every installation, there needs to be the appropriate certification, and in this instance it would need to be through the Energy Safe Association. We had a lot of difficulty with trying to get the equipment modified in Korea before arriving, due to the short time frames and communication difficulties with the company that designs the burners and valve trains for Proaster. Parts were also an issue, as Korean companies typically support local manufacturers, so we were dealing with Korean burners and Korean valve train components - most of which were not approved for use locally. We would typically do this in our factory; however, due to the size of the equipment, the only option was to do it on site once it arrived. We ran into further difficulties when the gas installer commissioned to do the work locally sadly passed away two weeks before the equipment arrived. Luckily, we were able to arrange another gas installer at short notice, but had missed some valuable time in preparation for the commissioning work. An army of three Proaster Engineers and two from Coffee Roasters Association, including myself, came down for the installation, which we planned to complete within 5 days. The equipment arrived to the shipping port on the 16th of July, in one 40 foot and one 20 foot container. This presented us with our next challenge, as the location could not accommodate the 40 foot container for unloading. Therefore, the decision was made to unpack the 40 foot container off site and have it delivered loose. The 20 foot container was delivered to the site earlier and was unloaded without incident. It gave Justin a chance to polish up his forklift driving skills before the heavy equipment arrived! Then the unpacked 40 foot container was delivered a couple of days later. It was then revealed that some major damage to a critical component had occurred during unpacking and transport. The damage was to the mounting bracket for the main drum fan impellor housing. Without this fixed, the system could not be run. To get one remade and sent from Korea would have taken a few weeks, which we didn't have. Fortunately, I was able to take it to a fabricator who was making some other equipment for us and was able do a favour and repair it within 2 days. The assembly was completed in 4 days, which was helped by the fact that all the connecting flues were supplied with the equipment. Having the Proaster Engineers present for the installation was a huge help. During the assembly, numerous meetings were held with the local gas contractor to sort through the compliance issues. This was the most challenging part, as we had to sort through the PLC control system and come up with a gas safety circuit that would satisfy the requirements of Energy Safe Standards. We also realised at the time that some additional electrical modifications would be required to meet electrical standards, particularly the additional earthing of components. Unfortunately, we were not able to test with gas at the end of the assembly, as the gas and electrical modifications needed to be done and plans submitted to Energy Safe Association for preapproval. Also yet to be done was the main insulated flue running off the afterburner. In the end, it took another 3 - 4 weeks to finalise the changes and get the approval from Energy Safe Association. That being said, it is still a quick turnaround, given this was the first installation of this model. Getting focused time from local contractors is always hard, as they juggle numerous jobs. There were some additional teething problems that were eventually sorted. These included upgrading the gas meter to compensate for a drop in line pressure and also changing the afterburner cowl to a less restrictive one. The setup is impressive, and the coffee has been great since the roasting began. The factory is in full swing, roasting up to 10 tonnes per week. Last time I was there, they had put in a hoist to speed up the loading of the green coffee into the green bean loader, and the cupping room was almost finished. This was an exciting project from the beginning, for which I am grateful to Justin and AESP for the opportunity. I was so impressed with the quality of the equipment and the service Taehwan Automation provided we came to an agreement to act as their local agents.